Ellen Hume is an Annenberg Fellow in Civic Media at the Center for Media and Communication Studies at Central European University in Budapest. Until June, 2009 she was research director of the Center for Future Civic Media at the Massachusetts Institute of Technology. Previously, she served as the director of the Center on Media and Society at the McCormack Graduate School of Public Policy at University of Massachusetts Boston, a center that she founded. 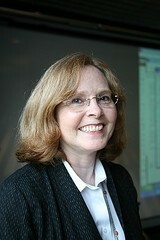 She is Editor in Chief of NEWz, the New England Ethnic Newswire (http://go-NEWz.com), which she created in January 2007. She also designs and teaches undergraduate courses about the relationship of journalism to politics and public policy. Hume is an experienced journalist, teacher, speaker, administrator, conference director and television commentator. She analyzed the relationship of journalism, the Internet and democracy in her prizewinning 1995 study, Tabloids, Talk Radio and the Future of News and explored American efforts to develop journalism around the world in Media Missionaries, a 2004 report for the Knight Foundation. As the Executive Director of PBS’s Democracy Project, from 1996 to 1998, she developed special news programs that encouraged citizen involvement in public affairs. She oversaw PBS’s 1996 and 1998 election coverage, creating PBS Debate Night, a nationally televised live Congressional leadership debate, which was partnered with 70 live local candidate debates on PBS stations across the country the same night. She also created “Follow the Money”, PBS’s 1997 weekly television and Web series on the role of money in American politics. At PBS, she developed “resource journalism,” a multimedia approach to news coverage. Hume has more than 30 years of experience as a reporter and analyst for American newspapers, magazines and television. She was a White House and political correspondent for The Wall Street Journal from 1983 to 1988, and a Washington-based national reporter with the Los Angeles Times from 1977 to 1983. Her journalism career also included stints at KTMS Radio, The Detroit Free Press, Santa Barbara News Press and other newspapers. From 1988 to 1993, Hume served as Executive Director and Senior Fellow at Harvard University’s Shorenstein Center on the Press, Politics and Public Policy, designing conferences and teaching graduate seminars on media, politics and government as an adjunct lecturer at Harvard’s Kennedy School of Government. Hume joined Northwestern University’s Annenberg Washington Program in 1993, teaching Medill journalism students during their Washington semester, and analyzing how new media technologies are changing journalism and politics. An acclaimed television commentator, Hume appeared weekly as a media analyst on CNN’s “Reliable Sources” (1993-1997) and as a frequent panelist on PBS’s “Washington Week in Review” (1979-1988). She co-anchored PBS’s live coverage of the congressional hearings on Waco in 1995, and from 1990 to1992 she moderated “The Editors” talk show on Canadian public television. The recipient of numerous honors and fellowships, Hume has conducted journalism and democracy workshops throughout the United States, in Ethiopia, Russia, Bosnia, Poland and the Czech Republic. She and her husband have four children and live in Boston, Massachusetts.